I purchased my Walther P22 for one reason and one reason only: The small grip circumference. 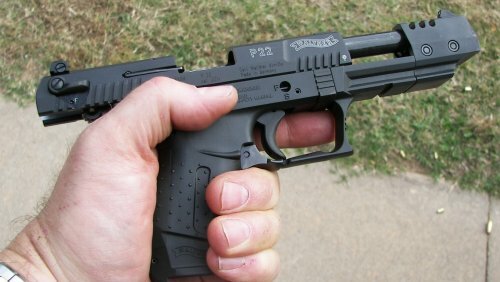 My former .22 pistol which was a Beretta Neos, was too big for my wife's small hands and too heavy for my daughter or her to hold up for extended periods. The answer seemed to be the Walther P22. So light I have to look at it to make sure I have it in my hand. The grip is so small I could grip and shoot it using two fingers and a thumb. I didn't know how it would shoot, or how dependable it would be, it just had to qualify as something they could shoot because they are very specific about what they will shoot. Too heavy, large, too much recoil or too loud.....forget it. When I purchased the pistol I did have one positive thought: This thing is cool looking. In spite of it's diminutive size, it looks deadly. For my .22 plinking ammo I use Federal value packs purchased from Wal Mart. A box of this stuff costs less than $10 for a box of 550 rounds. With this ammo, I have not had a gun shoot more than 50 rounds without at least a couple failures to fire. Amazingly, my Walther P22 now has around 600 rounds of this federal cheapo ammo through it with no failures to fire. And plinking has never been more fun or easier for anyone of any size. 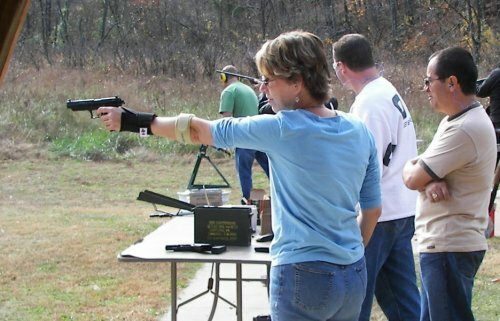 A lady who is a member of our shooting group is shown below easily shooting the P22 one handed. That's in spite of some significant hand and shoulder problems she had dealt with just before this range session. 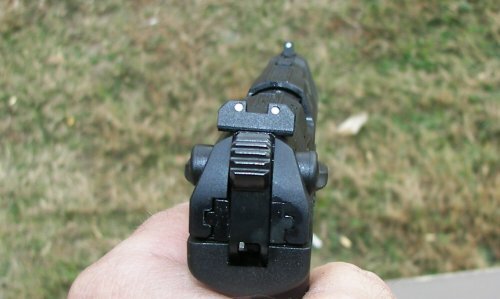 The action of the Walther P22 is standard double action/single action with an 11/4 lb trigger pull. If you want to shoot the gun double action, the decocker is really odd on this gun. To decock it, you set the safety on safe and pull the trigger. Yep, that's not a misprint...you pull the trigger to safely drop the hammer. The best route is to not bother with double action shooting with this gun. 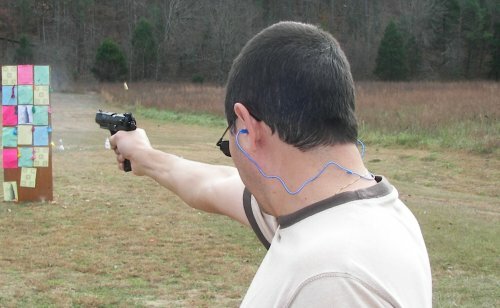 The single action shooting is easy and fun. The Walther P22 comes in two sizes: one with a 5" barrel (mine shown) which also has a compensator that probably doesn't actually accomplish anything. It just makes the gun look cooler. It also comes in a model with a 3.4 " barrel with no compensator. The gun features interchangeable backstraps to better fit a shooters hand, ambidextrous controls, magazine disconnect, hammer safety and firing pin safety, fixed (read more accurate) barrel, and interchangeable barrel. The gun is only 18.7 oz, comes with two 10 round magazines, rear sight adjustable for windage, 3 interchangeable front sights for elevation, sights of the 3 dot configuration. The gun is plenty accurate with the fixed barrel contributing to that aspect of the gun. With it being super light, it is easy to maneuver and the sights come in line quickly on the 5" model. People who shot it initially loved it and could hit anything they shot at with little time to get used to the gun. 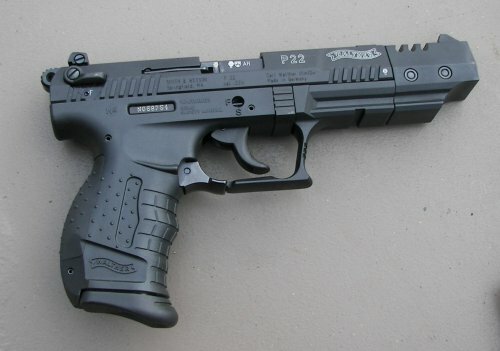 When I purchased the Walther P22, I thought it to be a little pricey at around $360 plus tax new. But considering the weight and size, ability of people of all sizes to shoot it, accuracy, and exceptional dependability, I now consider it to be a good value. I would highly recommend it to anyone looking for an acceptable .22 pistol for the whole family. When I bought this gun, I was a little despairing of the price, but it had the grip I knew my wife and daughter would be able to handle. At this point, my opinion is that this gun would be a bargain at twice the price. This one is a keeper and I expect it will be with us for a long time to come. 12/29/07 Update: My opinion of the little Walther P22 just continues to grow as the gun is fired by more and more people of all ages. The gun continues to be the only 22 I shoot with Federal bulk (cheap) ammo and does not fail to fire. So far around 1200 rounds of this failure prone plinking ammo without any hiccups. And today was the icing on the cake when I took my wife, who is not an avid shooter out to the gun club to shoot for a couple of hours in 30 degree weather to try out the little .22. I set up some Shoot-N-C targets and had her start shooting from a short distance, gradually stepping back as she got used to the gun. After a little adjustment to her stance and grip, I backed off and just let her shoot. Now you have to understand I shoot a lot and she shoots very little. And she doesn't like too much recoil or too much noise. And I mean little above a BB gun. But I saw the change come as she shot the gun and pierced the cool "splatter hole" targets, then regular paper targets. But it was the paper prairie dog target shooting the little fake animal in the head numerous times that sealed the deal. And she had a great time with that gun. It was the kind of experience you want your non-shooting family members to have when you take them out.....so they'll want to come again. And the Walther P22 performed like it always does, flawlessly and accurately. 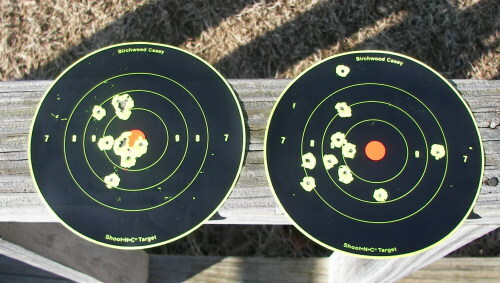 Below are a couple of her targets. The one on the left is from about 12 feet, the other from about 20 and she continued to move out as she gained confidence. 08/03/2011 Update: I don't own many guns this long. And they have to be pretty special for me to do so. But I still own the Walther P22. It has now had thousands of rounds put through it and remains one of the most dependable 22s I've not just owned, but ever seen. Just recently, a woman who is a friend of ours used it to take her Concealed Carry class. The gun did what it has always done. Performed admirably and provided her with an easy to use and shoot firearm to test with. Of all the handguns I've purchased over the last 5 years, the Walther P22 sits on the top of the heap as one of the best of the best handguns.